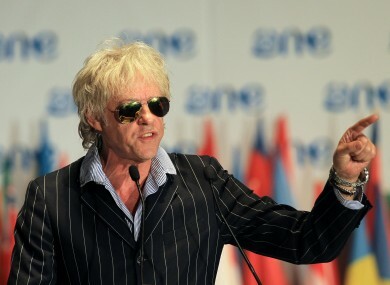 Bob Geldof at last year's summit. BUSINESSES IN DUBLIN have been encouraged to get behind the ‘One Young World’ summit that will be taking place in the capital next October. The event, now in its fifth year, will see speakers such as Bob Geldof and Arianna Huffington join more than 1,200 delegates aged between 18 and 30 in Dublin from October 15-19. The purpose of the summit is to connect young adults who have shown leadership in any field with ‘counsellors’ in the form of world leaders and entrepreneurs. While together, they will debate issues of global concern, such as climate change and the economy. Kate Robertson, a co-founder of OYW, said that the problems facing young people today are global and “will not be solved by national institutions”. “When you are young you actually do believe you can make a difference, you have time to make a difference. [OYW] isn’t just another jolly good conference, it has a purpose,” Robertson added. Dublin beat Hong Kong, Edinburgh and Bangkok to be chosen to hold this year’s summit. Businessman Maurice Pratt was on the bid advisory committee and noted that “winning the bid was just getting the ball thrown into the pitch, but now the game is on”. He called on businesses to sponsor delegates and help “create an environment in which talent itself is inspired”. In October 2013, Lord Mayor of Dublin Oisín Quinn travelled to the summit in Johannesburg in South Africa. Speaking today, Quinn said that this “phenomenal” event “seeks to unleash the energy and talent…and disruptive impetus of young people”. More than 190 countries will be represented at the summit. Quinn noted that kind of diversity is “exactly what Dublin represents”. Bob Coggins, a bid advisory committee member and former delegate, said that Dublin’s bid was successful because it was primarily organised by a small group of young people, not a corporation. “We want to welcome the world to Dublin … again,” he added. Past OYW counsellors have included Kofi Annan, Archbishop Desmond Tutu, Sir Richard Branson, Professor Muhammad Yunus, Jack Dorsey and Jamie Oliver. Some of these speakers are also expected to attend October’s event in Dublin. Email “Youth leaders to debate global problems with Geldof and Huffington in Dublin”. Feedback on “Youth leaders to debate global problems with Geldof and Huffington in Dublin”.